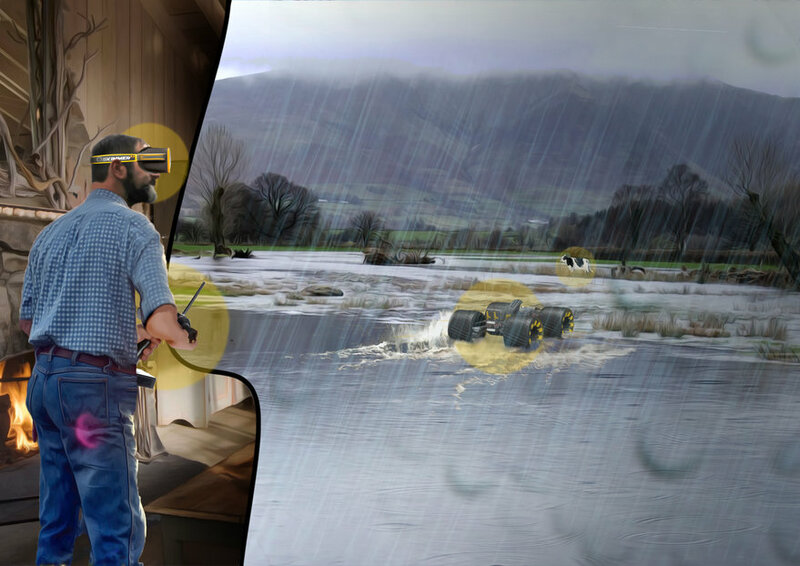 The Skimmer Rescue Platform is a proprietary vehicle technology developed to provide various forms of hands-on and augmented smart assistance for rescue, disaster relief, and asset management teams. 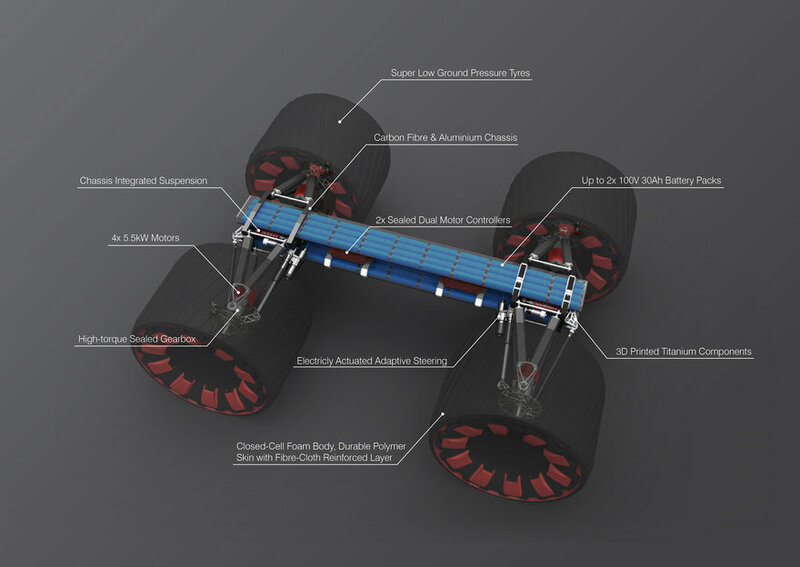 Skimmer is an ultra-lightweight, single-personnel, battery-powered smart vehicle with high power in-hub electric motors, extremely low ground-pressure and buoyant air-less tires. 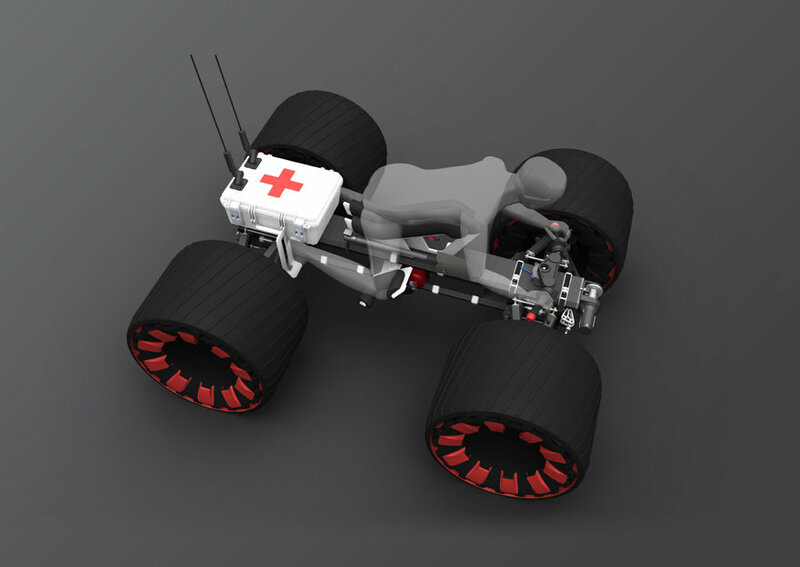 Skimmer's ultra lightweight construction and smart electric drive systems, combine extreme terrain traversing capabilities with fast, agile mobility and minimal environmental impact. Its advanced drivetrain and drive-by-wire systems allow for maximum control and performance with automated drone capabilities. 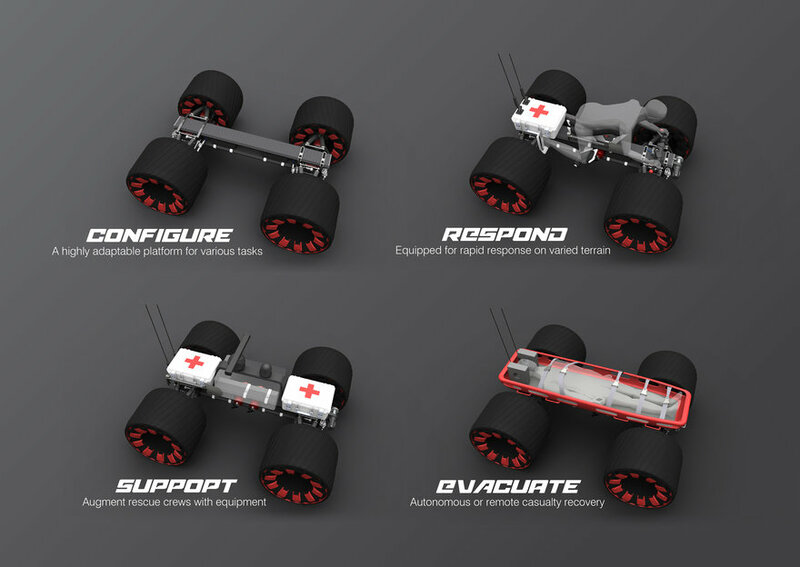 Skimmer is a highly adaptable modular personal-vehicle, and a rapidly deployable autonomous chassis platform for a range of scenarios including; rescue crew augmentation, casualty extract, re-supply, disaster-relief, recon, scout, mobile communications, and hazard identification and mitigation. Skimmer allows rescue teams to respond to an extensive range of disasters quickly. Launched from an offshore ship or dropped from an aircraft, Skimmer can be called into action in cut-off areas even before the exact requirements are known. Skimmer could also be unmanned and sent in remotely to operate in high-risk environments or for large-scale disaster evacuations or rescues. 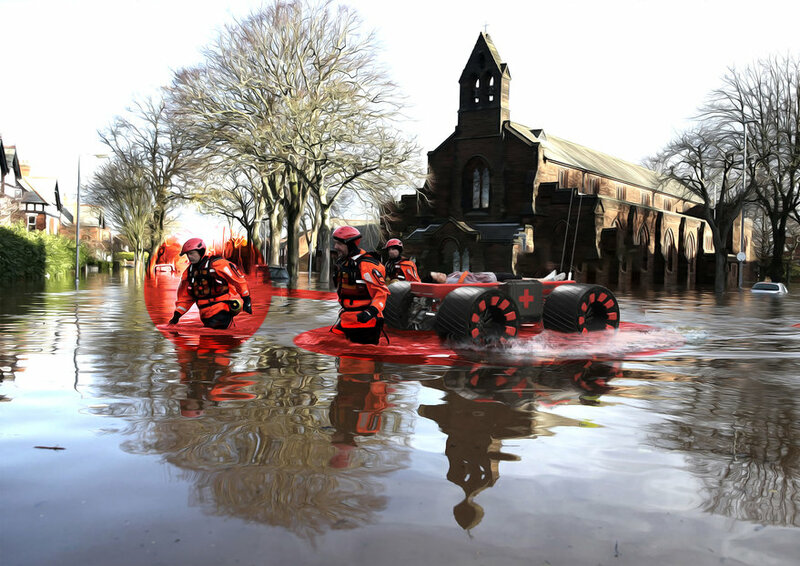 Skimmer can provide a support platform to follow rescue teams, carrying supplies or medical equipment to aid relief. Urgent evacuations of injured people can take place autonomously while additional Skimmers are sent in to join ground teams. In an asset management scenario, Skimmer can provide a semi-autonomous vehicle for inspecting and identifying endangered stock or threats. Vast areas of terrain can be covered remotely with long range capability and limited risk of failure, even in dangerous weather or largely forested or damaged terrain. Skimmer was designed to offer support in areas where heavier, noisier and less capable vehicles would hinder such efforts. It is a tough and reliable vehicle that can endure a huge array of weather and terrain types. It can traverse soft areas where existing comparable vehicles are unable to venture, including marsh-lands and in frozen climates with grounds composed of soft sand, mud, weed or ice and snow. The ability to ride across soft snow powder and thin ice removes physical barriers and reduces human risk, therefore, increasing mobility and survivability. The ability to be completely buoyant opens up new mobilisation possibilities offering minimal physical barriers across huge amounts of terrain. Skimmer technology heralds an all-new vehicle category with unmatched and adaptable capability. 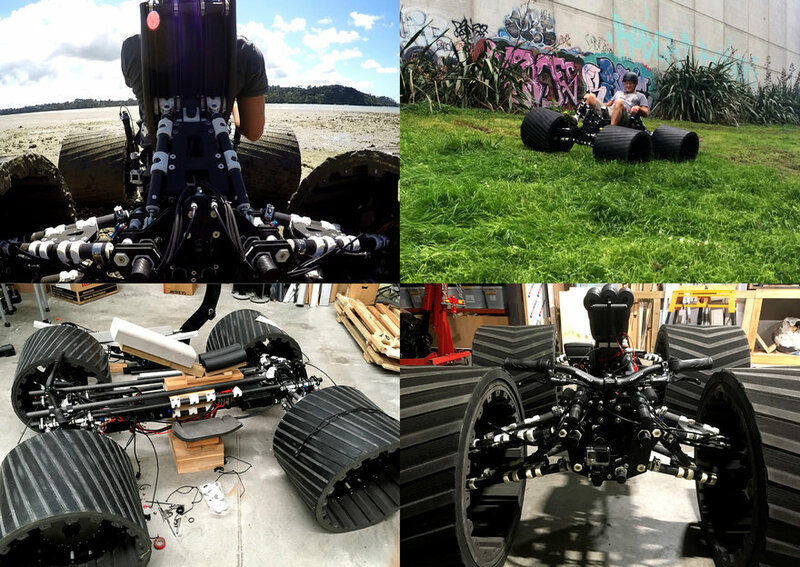 With the Skimmer Rescue Platform, we wanted to create a vehicle that opens up opportunities for exploring and surveying terrains which were previously obstacles or had barriers preventing true exploration. The key here would be designing something much lighter than other single person vehicles, a vehicle light enough to perform on soft terrain and cross waterways while still offering high performance and modularity. It would have a simplicity to its design, utilising the latest technologies, and offer something truly unique. There is a lot of development currently for aerial vehicles, specifically dual and quad rotor designs for human transport and rescue operations. We found in support of aerial types or vice-versa there needs to be an agile ground unit, capable of many aspects where drones may fall short including; flight-time, payload capability and weather conditions. These vehicles would compliment each-other in a rescue scenario; small scout drones could be charged and launched by a ground unit, surveying huge areas of land from a range of perspectives. A highly capable ground unit offers a lot of support features in both hands-on or hands-off configurations. During the design and engineering phases traditional vehicle construction methods were challenged to produce a more infrastructure-light process for manufacturing. We focused on a modular and adaptable system which could be assembled from prefabricated components requiring minimal investment for low volume production. We focused on clean pre-preg type composites and custom carbon fibre tube designs which can be manufactured in-house or by local industry utilising advanced materials but with simple techniques, as well as 3D Printed plastic and metal components which could be produced by in-house equipment or equally outsourced. These major chassis components provide the perfect components to perform the key requirements of Skimmer's largely functional design. We then brought these components together where the focus could be on the engineering and assembly of the vehicle, we kept this process clean and efficient by removing messy glues and welding, reducing additional systems and processes required to bring the Skimmer together, this could easily be scaled and implemented quickly and effectively. This manufacture process and system also lent itself well to providing a hi-tech lightweight design while being able to adapt to various use cases. 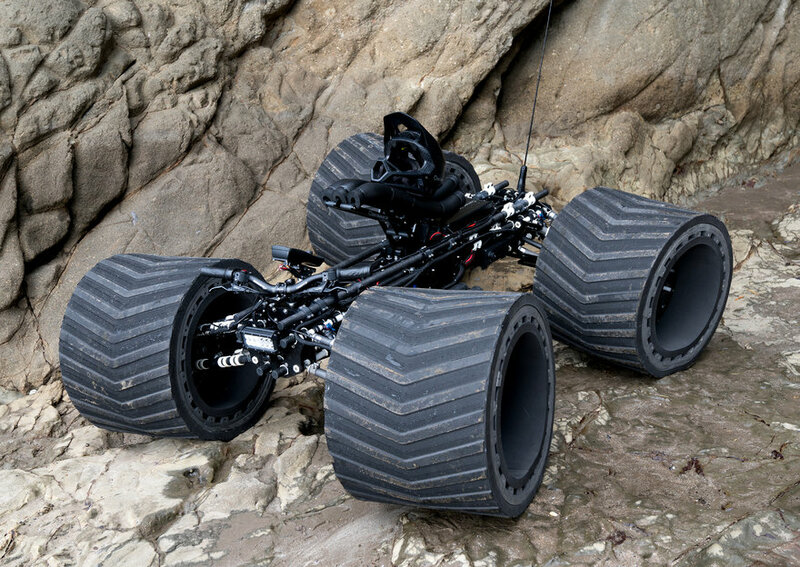 This is reflected in our electrical system, removing large amounts of mechanical linkages and complexity found in terrain capable vehicles with more of a drive-by-wire system, allowing Skimmer to easily adapt its control on-the-fly between rider, remote, and autonomous modes while keeping a lightweight system. Riders can simply jump off, grab the controller and FPV Goggles and drive off to sout dangerous terrain remotely. The smarts are located on a central processing unit which communicates with the motor controllers and steering actuators. 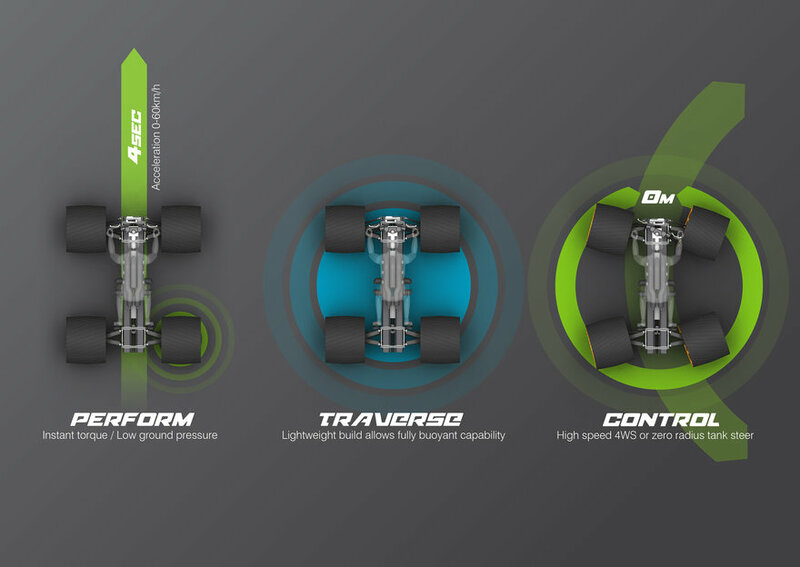 The 4x in-hub motor performance can easily be switched between drive modes for terrain types. This would also include various driving styles, as the system would have individual steering control over each wheel, able to switch between tank, crab and 4 wheel steering and perform a range of manoeuvres with ease, be it evasive in disaster scenarios, or for precise positioning of sensitive communications equipment. We also knew that we had to push other boundaries, we focused on the wheel design, reducing weight and adding durability. We developed a segmented moulded closed-cell foam system with multiple thin outer layers to offer wear durability, strength and flexibility. This is constructed around a carbon fibre plate rim system to aid with flexibility in rough terrain, apply our low ground pressure requirements. Traversing unstable ground following disasters in rural or central urban areas it is necessary to take precaution to minimise further impact from heavy search vehicles. The current Skimmer prototype is custom built from the ground up to provide an agile test platform for performance and user case validation. It has transformed through various revisions trialling new mechanical and electrical features. The first effort aimed to produce a personal vehicle for a rider in a recumbent position, offering an ergonomic way to input a high-level human power which would then be supplemented by the electrical drive. This system also provided a way to extend range and make the user feel more connected to the experience, having the vehicle respond to the amount of power that was input. 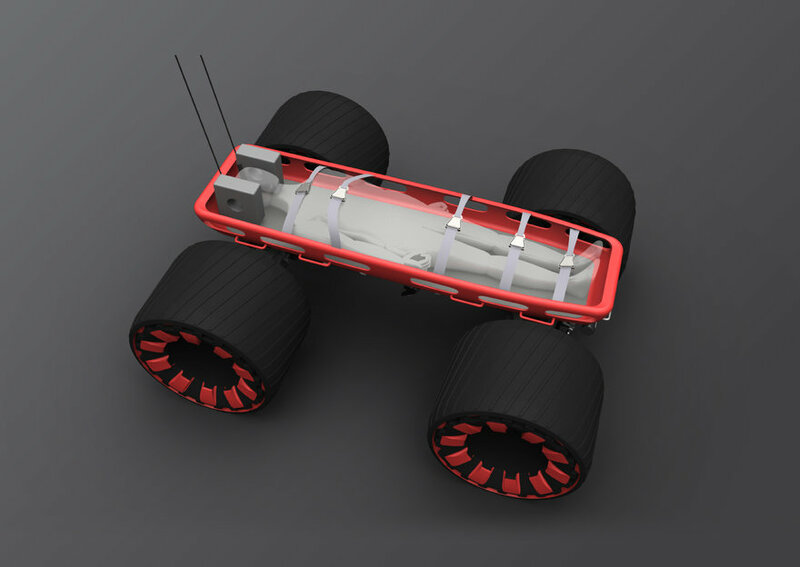 From here we wanted to push to more of a modular platform approach and in response to further research to provide a multi use platform which could carry payloads and operate remotely or autonomously with easy configuration. We fitted the system out with remote capabilities to test basic operation of the vehicle, following this we changed up the seating to a sport jockey position to have something that could easily be added or removed as needed. Swapping out the configuration from rider-based to a large platform to carry payloads and emergency gear would then be made easy. After initial performance testing of the hub drive system, we also increased our wheel diameter by 100mm up to the intended size to move towards testing of our performance on water. From here the prototype would endure various scenarios and tests to communicate its advantages over other solutions. 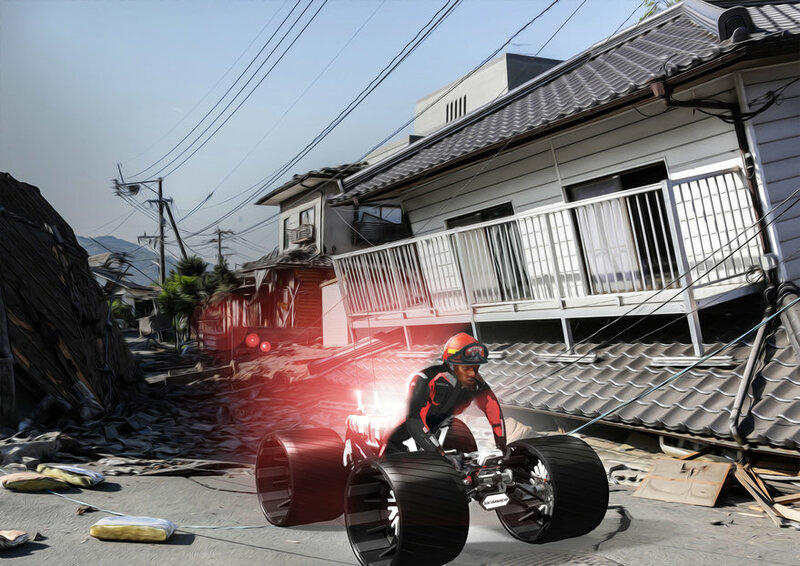 Whether by being ridden, operated remotely carrying support equipment, or part of an autonomous scouting or aid-delivery over risky terrain, Skimmer is a valuable tool to mitigate risks and improve critical task response times and increase disaster scenario response capabilities. The ability to build and assemble with limited infrastructure and utilise the latest materials through now widely available manufacturing techniques allows manufacturing to be set up in a lean and adaptable way as needed to suit various commercial applications. 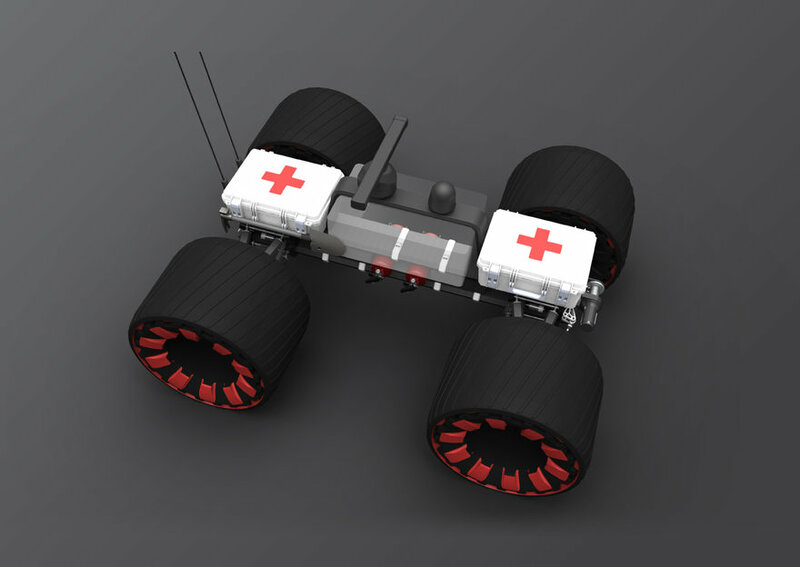 The Skimmer offers an adaptable smart platform allowing for specific configuration of rescue and commercial support vehicles as an essential aid in dangerous tasks which may normally have larger risk factors for humans to take part. Mitigating the human risks and submitting a smart machine to the potential dangers of disaster scenarios is how we envisage the future of these types of operations. This is the true value of the Skimmer rescue Platform. We are excited to see the positive impact that Skimmer will have on search, rescue and relief efforts worldwide.